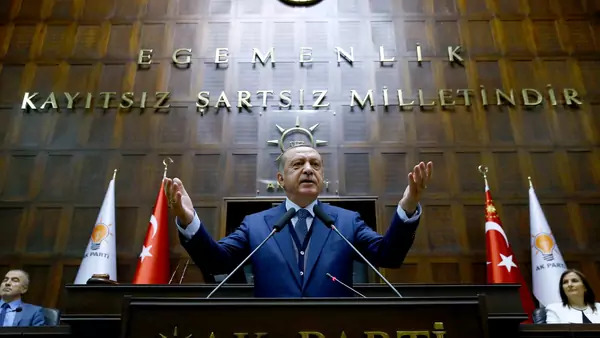 Turkish President Tayyip Erdogan addresses members of parliament from his ruling AK Party (AKP) during a meeting at the Turkish parliament (Kayhan Ozer/Presidential Palace/Handout/Reuters). This article was originally published here on the Atlantic's website on Sunday, June 25, 2017. Turkey has imprisoned 177 other journalists, but never a non-Kurdish parliamentarian. The charges against him are fabricated—he has run afoul of the government because he does not support the ruling Justice and Development Party’s (AKP) religiously based agenda to transform the country, and is believed to be a source in a story detailing the shipment of weapons to extremist groups in Syria by Turkish intelligence agents. In response to his imprisonment, the leader of Berberoglu’s party began to lead a nationwide march for justice. The unfolding Berberoglu drama is about freedom of the press, the arrogance of power, and justice, but it is also emblematic of the intra-Turkish struggle between the AKP faithful, followers of Gulen, secular elites, Kurds, and liberals.